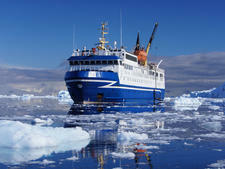 Editor's Note: Ocean Diamond is currently chartered by tour operator Iceland ProTravel. 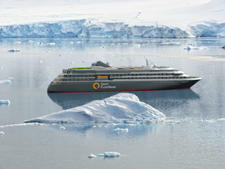 Ocean Diamond is one of the larger ships in the Quark fleet, carrying 189 passengers on journeys from Ushuaia to Antarctica. 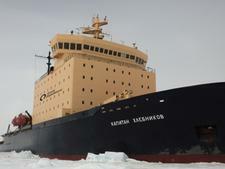 It's the first ship in the region to offer carbon-neutral voyages. 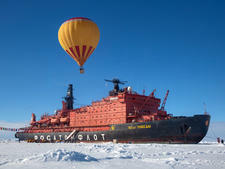 It's also one of the faster ships sailing to Antarctica, saving up to 12 hours on the crossing of the notoriously rough Drake Passage (weather permitting). Public spaces include a panoramic observation lounge, lecture theater, library and social lounge. Passengers can take advantage of wellness options that include aromatherapy, massage treatments and yoga classes. There's also a small gym. The ship has an elevator for passengers. All cabins on Ocean Diamond have exterior views, through either windows or portholes (though some are obstructed). The ship offers numerous suites, including 10 with balconies on the Observation Deck. Each suite has either a double bed or two twins, as well as a separate sitting area. Twin cabins also offer a choice of a double bed or two twins, while triples have two twins and an upper berth (except for cabin 332, which has three lower beds). Solo travelers can avoid a supplement or an assigned roommate by booking one of the dedicated singles cabins, each of which comes with a double bed. All cabins -- except the porthole singles -- have bathtubs, as well as showers. Flat-screen TVs and DVD players are standard across all categories. 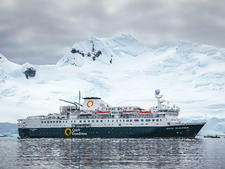 While Zodiac cruising, hiking and snowshoeing are staples of Ocean Diamond's Antarctica itineraries, active passengers can pay extra for optional activities, such as kayaking, cross-country skiing and mountaineering.